I've been reading so many fantasy novels these days that I'm surprised to even pick up anything realistic and compelling. 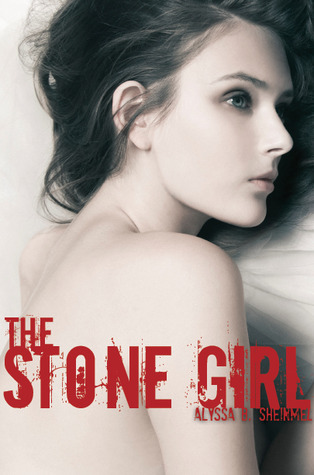 The Stone Girl is an electrifying story depicting the realness of a disease that has plagued many young girls (sometimes boys) for centuries. This book is not for the faint at heart, if you're an overtly emotional reader who tends to react hysterically to dramatic description then I suggest you prepare yourselves greatly for what you're about to get in to. The story focuses on not only the clear topic at hand, which is the main character's eating disorder, but also on everything else she's facing in her life. Her world is one filled with great challenges and that adds to the intensity of what's being told. I must add that it's very descriptive; Alyssa delves in the process of regurgitating and the emotional process involved. I've never completely understood eating disorders nor the minds of those struggling with it, but I liked how the author went into Sethie's situation allowing the readers to see from her perspective of what it's all about. In terms of character building and the surrounding, I'd give a perfect score because Sethie was someone you not only read about, but someone you see around you in your daily lives. There are so many girls struggling the way Sethie does with all the pressures of society: school, relationships, status, and appearance. The plot was well thought out and well delivered, so I must commend Alyssa on a marvelous job done. Sethie, in my opinion, is a brilliant student who got the wrong idea about image. And having such a poor excuse of a "boyfriend" doesn't make things better either. I got so angry with her for not realizing how naive she was about him. He didn't acknowledge her in public, nor was he affectionate in a way that a guy who truly cares about a girl would be. Why couldn't she get it in her head that this guy was bad news and was the reason she was doing other negative things. But then it made sense that the author would make Sethie out to be the overachiever who wasn't so perfect underneath it all, because aren't many people in general like that. We all have something to hide, no? The one thing I didn't like was how overwhelmed I felt at times by all the details. It got to a point where I understood Sethie's story so much because it kept repeating throughout every chapter. It almost got predictable and over-dramatized, never moving on to something else but instead the story kept stagnant for a while. I sympathized so much that I was all out of sympathy. Isn't that weird? Anyways, It did get better towards the end and I liked the conclusion. The book was indeed a quick read. You'll finish it in no time; that's if you can get over the graphic details. Alyssa Sheinmel is a wonderful author who writes intense novels, I believe this is her third and it definitely made me want to check out her other releases. I suggest you do the same. The Beautiful Between. I still don’t write every day; sometimes I get caught up in other things, and sometimes I’d just rather park myself in front of the TV and watch reruns of The West Wing. But I always find my way back to my computer; I always remember just how much fun writing really is. And the great thing about writing – at least in my experience – is that it comes out best when you’re doing it for the very, very fun of it. Fascinating! Eating disorders are one of those disturbingly common problems that very few of us really understand. I'm glad there are books to try to bring it to light. Thanks for sharing! I've mostly seen movies about it but never read about it so this was definitely new for me. Seems like a good book on a really important subject. I'll admit, sometimes I shy away from books that are too "real" because I like a bit of escapist fun, but I think they're really important to have written. Me too, lol. But it's good to give books like these a chance. You might be enlightened. Great review. Sounds interesting and addresses a really important issue. Oh wow. This looks like a great book with such an important message. How heartbreaking that this disease is all too common. Wow... I have to admit, when reading the first paragraph of the summary, I thought that this book was a paranormal one... But then again, it deals with way deeper issues! I love your review, looks like you managed to capture the book perfectly! Thanks for stopping by and thank you for the compliment. The book really is insightful. I am so glad this was a good read for you, Shane. I grabbed a copy because this is such an important topic and I am always looking to read more on it! I hope I enjoy it as much as you.